I am an Affiliate Faculty Member of the Microeconomics of Competitiveness program at Harvard Business School, and a big fan of Michael Porter – his work consistently reminds me of the importance of bringing clarity to management practice. I also like his inclination for frameworks rather than models. If your goal is to interpret and assess, as opposed to measure and predict, a framework is a critical analytical tool. One that I especially like is his explanation for what determines competitiveness. 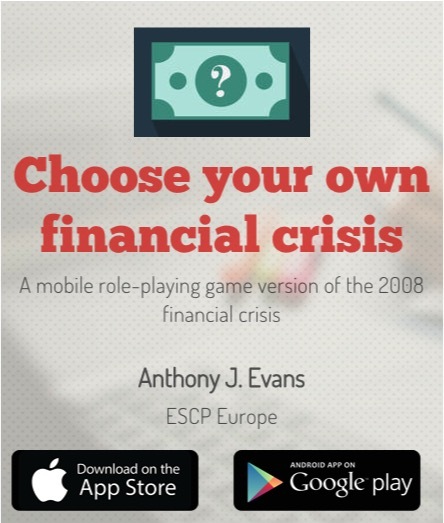 For example, consider the following slide (which I believe originates from here). 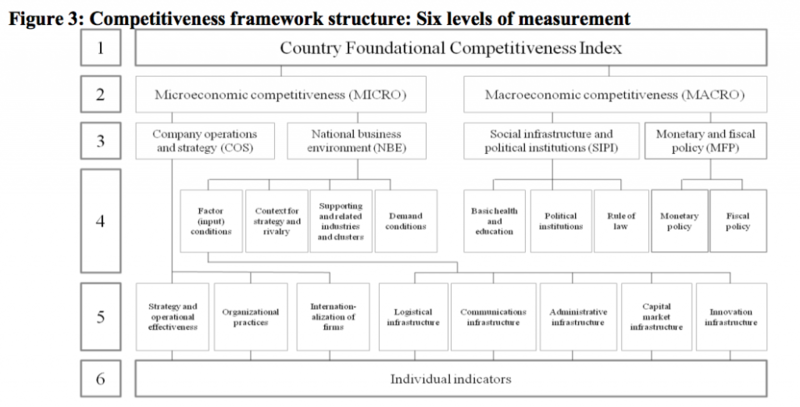 This clearly shows that the Diamond model is intended to be a more detailed view of the “Quality of the National Business Environment” segment. But consider something like nutrient rich soil, or a large natural harbour. One might think that constitutes an endowment. But it is also a relevant “Factor input condition”. 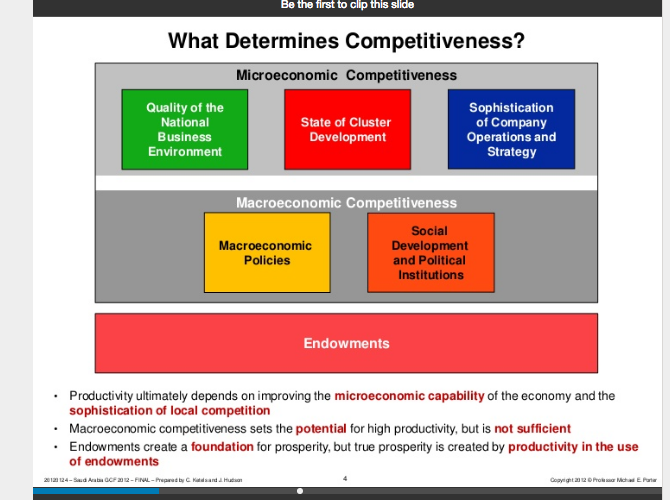 Indeed what’s the difference between the “Supporting and Related industries” and “State of Cluster Development”? I suspect this is why Figure 3 above has dropped endowments and clusters, and renamed it a “Foundational Competitiveness Index”. 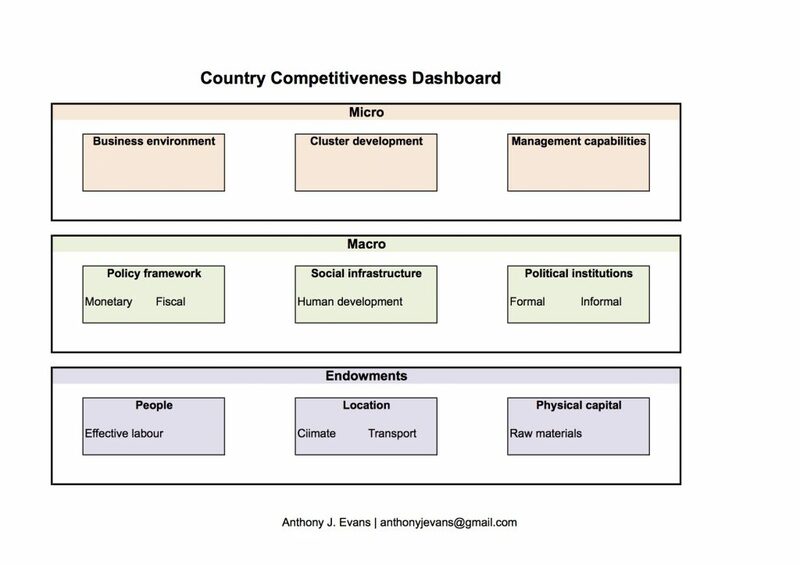 I think this is a shame, because the “What Determines Competitiveness” slide is clearer, and more coherent, than the FCI. Rather than viewing the Diamond model as a subset of the “Business environment”, I see it more as a strategic tool that cuts across the whole Country Competitiveness Dashboard. In other words step 1 is to populate the dashboard, and ensure that you are covering all bases. Step 2 is to conduct a Diamond analysis – which is better suited at the cluster level than the national level anyway. 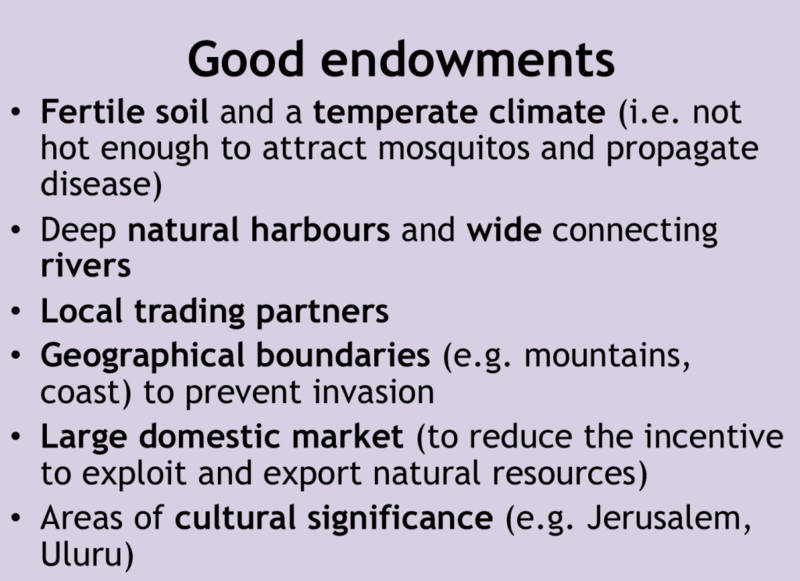 The endowments above are rooted in economic growth theory, but I am always struck at how important they seem to be when reading geopolitical accounts. The list below shows some of the typical go to areas when trying to understand the starting position of a country. This entry was posted in pedagogy on October 11, 2016 by aje.